This was one of those occasions when I had an idea in my mind but something completely different happened! I quite like the result but it doesn't have the drama that I was envisging in my head! Oh well - I'll get back to that idea at some stage! The colours are Dapper Denim and Wisteria Wonder. It doesn't show in the photo but, owing to the change in plans, the card also has a layer of Window Sheet which catches and reflects the light. I stamped one of the banners from the Hostess set Time of Year using Dapper Denim ink and cut out the centre part which I adhered to a Wisteria Wonder banner cut with a die from the Bunch of Banners Framelits set. 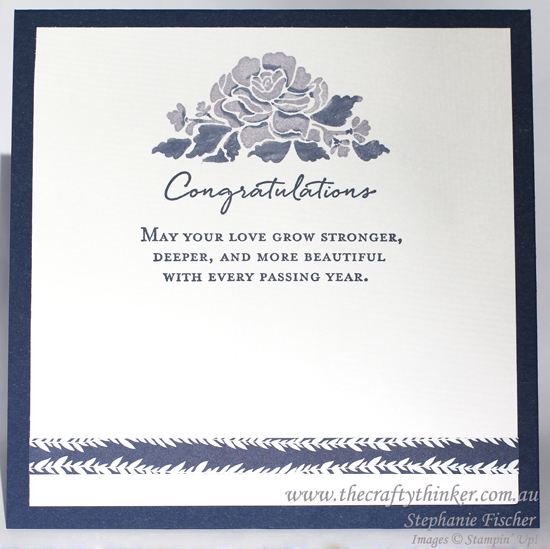 I inked the floral pattern from the Floral Phrases set with Wisteria Wonder and then added some Dapper Denim to the rubber in places (with a marker) before stamping the image onto Whisper White card. The greetings are stamped in Dapper Denim. 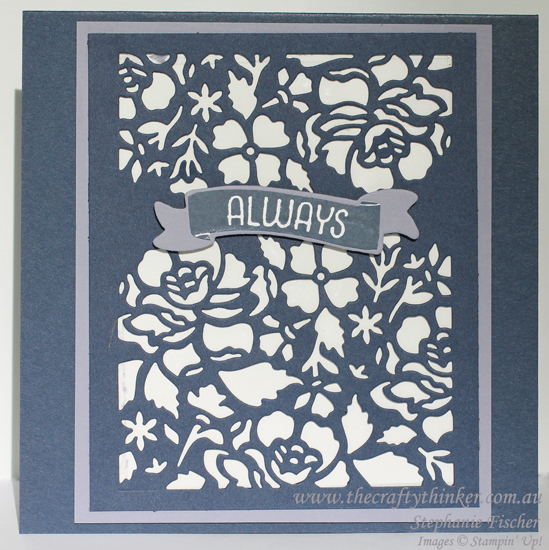 I added a thin strip of decorative paper from the Floral Boutique Designer Series Paper. I bought the Floral Phrases Stamp set and the Detailed Floral Thinlits Dies as a bundle to save myself 10%!